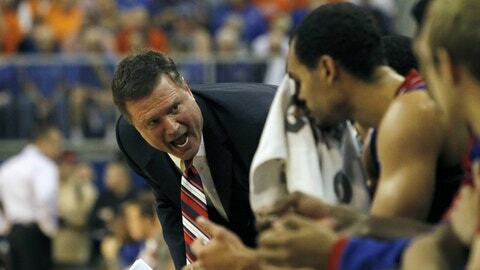 Perry Ellis, shown here with head coach Bill Self during a Dec. 10 game, is expected to return to play within a matter of days. LAWRENCE, Kan. — It’s a not a concussion. "It’s very, very slight," Kansas coach Bill Self said Saturday afternoon when asked about the status of sophomore forward Perry Ellis, his best post player. "But what he did was, he got hit and bruised a nerve in his neck, and it caused a problem." Well, that and several viral videos. If you haven’t seen the initial collision, you probably saw the aftermath. With 18:16 remaining in the Jayhawks’ 86-64 demolition of Georgetown at Allen Fieldhouse, Ellis took a feed from Kansas point guard Naadir Tharpe along the baseline, left of the paint. As he launched on an up-and-under move, he caught an elbow from Georgetown’s Nate Lubick. At first blush, it looked as if the Wichita native took a shot to the head. Ellis apparently thought he did, too. Because the rest of it, you probably HAVE seen: The 6-foot-8 forward stepped to the line, a career .748 shooter from the charity stripe heading into the weekend, and … missed by about four feet to the left. Then Ellis did something even scarier. He pointed at his temple. Twice. That raised eyebrows all over The Phog and on social media, which it bloody well should have. Head injuries are an inevitable part of the games we play, but they aren’t incidental parts, either. Discretion and common sense, lawsuit by lawsuit, are replacing valor and machismo when the human brain is brought into the equation. Knee ligaments, you can replace. Frontal lobes, not so much. So Ellis removed himself from the game, and then the floor, and didn’t return, which cranked the Twitter panic up a few more notches. And with good reason: Not only is big No. 34 the best pure post scorer in Self’s toolkit (his 13.3 points per game leads all KU big men), at least one site devoted to new hoops metrics — Sports-Reference.com — has stamped him as the most valuable Jayhawk in the zip code. According to S-R.com, Ellis began the weekend topping KU in offensive win shares (an estimate of victories contributed by a player due to his offense) at 1.0; defensive win shares (same deal, only with defense) at 0.6; and tied for the team lead in total win shares (1.5) with Andrew Wiggins. "He said when he shot that free throw," center Tarik Black said of Ellis, "he felt like he was going along with the ball." OK, so that’s not great. Black: "There in the back (of the locker room), he told us he was good." And, to be honest, the Jayhawks are, too. If there was a third sunny takeaway from Saturday afternoon a.) after Ellis’ prognosis (improving); and b.) a total curb-stomping of a Hoyas team that showed up with a national rank of 69 by the Ratings Percentage Index and 29 by hoops Gandalf Ken Pomeroy, it’s that there may actually life in the paint after Perry. The utter holy-crap-wow-ness of center Joel Embiid (17 points, eight rebounds, one block) is becoming a weekly deal now — we expected that. This time, your Jo Jo Moment Of Zen happened with about 4:45 left in the contest, when the long freshman took a carom off a 3-point miss by Wiggins and, with one hand, threw it back down through the rim with enough torque to set off car alarms in Colorado Springs. No, the toy surprise at the bottom of this particular KU Cracker Jack box was senior forward Tarik Black (17 points, six boards, two blocks), whose previous 10 appearances as a Jayhawk had been more notable for their brevity as much as anything else. At 6-9, 260, Black appears to be built like a defensive end, and some have compared his basketball acumen to one, too. Before Saturday, he’d averaged 2.8 points, 2.4 rebounds and 2.6 fouls per appearance. You knew you what you were getting from the former Memphis Tiger, and it wasn’t much. "I have a great coaching staff that told me to keep my head up and keep working hard," said Black, who’d averaged 9.3 points per contest over three seasons at his old school. "My teammates push me every day and tell met h same things. (Tharpe) always tells me, every day, ‘You need to play games like you (do in) practice and play hard.’ I kept my faith. And when the opportunity comes, you have to take advantage of it." They did. Repeatedly. In their first tilt back at Allen Fieldhouse in 29 days, the hosts shot 46 free throws, tied for the most ever by a Self team in a single game (Baylor, 2008). Faced with the challenge of maneuvering around 6-10, 350-pound Joshua Smith, the Jayhawks outrebounded Georgetown by 10. "We didn’t come ready to rebound; we didn’t come ready to fight," Lubick said. "And that’s why they won the game." "I don’t think we were physical (Saturday) at all," Hoyas coach John Thompson III noted. "We slapped and fouled, but we weren’t physical." Ellis might disagree with that last assertion, of course, once his head stops ringing. And speaking of, when we’re talking about a "short period," for Perry, how short is "short," coach? "Days," Self said. "No, I don’t think it’s going to be a problem at all."